Coupling spiders melting are generally due to one of two causes. Either the coupling is operating in a very hot environment that the elastomeric spider is not designed and rated to handle, the elastomeric spider is being exposed to chemicals it doesn't like, or there are torsional vibrations that are heating up the coupling from inside out. If the coupling spider looks like strands or strings of spaghetti have shot out of them, it is most likely the latter situation. If there are torsional vibrations in a system that are causing the spider to melt, the coupling must be tuned above or below the natural frequency of the system. Ideally this is accomplished by having an application engineer conduct a torsional analysis of your system (by providing him details about your system) and replacing the jaw coupling with a specifically designed torsional coupling. This is a significantly more expensive alternative to a jaw coupling, but is "the right" solution. Alternatively, users may also consider a "poor man's alternative" to a specifically designed torsional coupling by trying to manually tune the coupling above or below the natural frequency by changing variable about the coupling (such as elastomeric spider insert hardness and/or going up or down a coupling size). Such manual methods may more may not work. 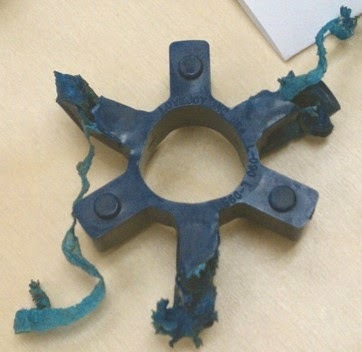 A rather comprehensive explanation and troubleshooting review of torsional jaw coupling failures is available within the fairly lengthy and largely all encompassing "Coupling Failure Analysis - Jaw Couplings (includes hub & spider photos)" article. 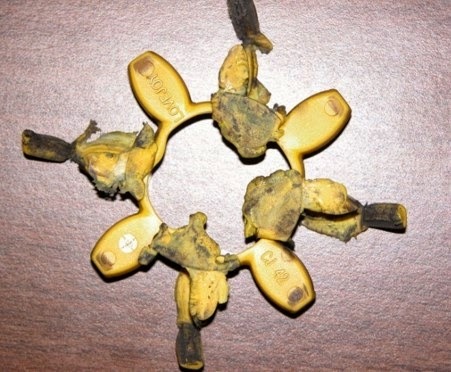 Users experiencing spider melting of any kind would be well advised to read the article, and pay particularly close attention to the environmental and vibration failure sections. This resource includes many photos and detailed analysis of various failures that may also be of great assistance to a reader.